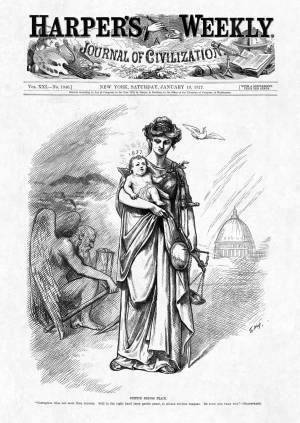 This Thomas Nast cover illustration (which was on the newsstands January 3) combines classical with traditional New Year's iconography to comment on the disputed presidential election. The old year of 1876 is the Grim Reaper, holding his scythe for gathering those marked for death and his hourglass denoting passing time, while buzzards hover overhead. The New Year's cherub offers an olive branch of peace. He is cradled by the goddess of Justice, who carries her scales and sword of justice, as the dove of peace flies above them.